Fox Parlor - Butterflies, everywhere butterflies! I woke up today with butterflies in my stomach and on my brain. Tomorrow is the first open day of the season, and we’re not really 100% ready for that to happen! A lot of things still need price tags, and I myself find it seriously annoying when things are not marked with a price in a store, so that has to happen. 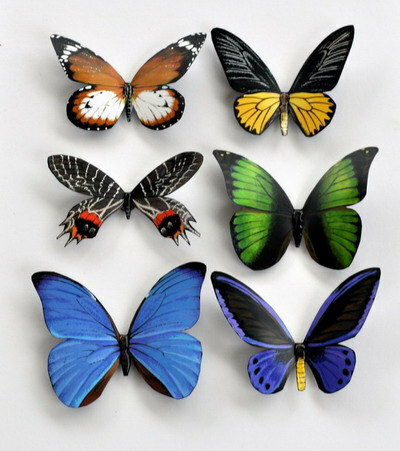 The butterflies on my mind are the ones I am making for hair pins, the magnetic beautiful ones from Doug Walpus that I arranged on the magnet board the other day, and the ones I saw on a new t-shirt I am thinking of buying some of for the store. And, it so happens that the air is full of real, wild and alive butterflies! Everywhere. I love the sight of little blue, bigger orange and yellow ones, multi-colored in between sized and even the gray moths at night. So, I will take that as a good sign that the ones in my stomach are as beautiful and happy as the ones around me, and off I go to tag stuff in the shop! Oh, and, if in town, come on by and visit us. Tomorrow, Saturday the 25th is opening day. We’ll be open Fri – Sun 11-3, though this weekend we’re open Monday as well. We have expanded into the back, have a lot of great new stuff and would love to see you.